All transactions are safe and secure with a reliable history in online purchasing behind each of our associates. 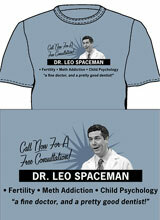 Buy the Dr. Leo Spaceman t-shirt to own 30 Rock clothing and merchandise. If you ever find yourself unable to adjust to your newfound fame, you might want to make an appointment with Dr. Leo Spaceman. Tracy Jordan's doctor is treating him for "erratic tendencies and delusions brought on by excessive notoriety." Tracy's unusual behavior causes Liz Lemon (Tina Fey) to inquire about the cocktail of medications that Dr. Spaceman has prescribed. The doctor tells Liz that he should be fine as long as he's kept away from bright lights, loud music, and crowds. Wear this Dr. Leo Spaceman 30 Rock t-shirt to promote the fine doctor, who's also a pretty good dentist. In addition to the Dr. Leo Spaceman tee above, browse the 30 Rock Clothing Gallery for more apparel like men's and women's clothes, kids shirts or hoodies.